How to write an appropriate abstract for an academic presentation? Are there any unique expressions in English academic writing? If any of this sounds familiar, then the English Academic Writing Boot Camp might be for you! Seating is limited, so register early! We will go by chartered bus, and the accommodation fees will be reimbursed. 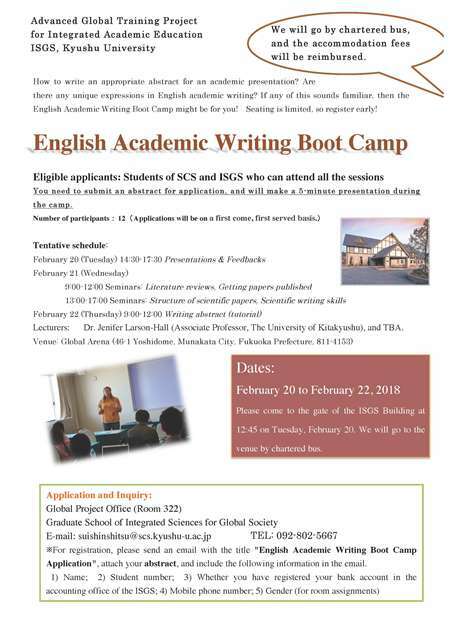 ※For registration, please send an email with the title "English Academic Writing Boot Camp Application", attach your abstract, and include the following information in the email.